Fred – thanks so much for posting this link. I wish I had been aware of this before my presentation. I haven’t read or, more importantly, reflected on it yet (Saturday evening isn’t conducive to reflective thought! ), but I will do. Wish I had been at Terry’s keynote. Lucky you! I have to tell you how much I enjoyed to participate in your session. You seemed very relaxed, the video was fine and the atmosphere was warm. I liked the presentation as well, I thought it was well designed for newbies, too. Not too much information or details. The trend goes toward more openness in the universities but I have a feeling that it is very limited today. Most so called open guys work outside academic life. For instance me, it is easy to be open when retired, nothing to lose any more. If someone is interested in my blog, it’s all fine. Expertise is non-rivalrous only partly, there is a long way to new open culture of sharing. Your diagrams inspire me, I should place myself on the map. And I forgot to thank you for the opportunity to DO something on the whiteboard in the session, it always activates. And also thanks for linking my blog and commenting on it, too. That’s exactly the point where my initial worries come from, but when I read your blog or see how you actively take part in this MOOC I feel like you are already out there. And knowing that others share the same worries I have, makes me a little bit more confident myself. After all, open access and these things are still fairly new and I suppose it is only natural to feel a little unprepared. But just by reading what the others on the course say, I feel like I have learned something. There is still the next big step of becoming more involved and outspoken… like Rudy, Heli or Marion and, of course, the others who seemingly participate with ease. Heli, Fred and Steffi – thanks for your comments and visit to my blog. Fred – thanks for the new link – very helpful. I’m looking forward to digging into all this a bit deeper. Heli – Thanks so much for your kind words. I agree that it is easier to be open once your career is established or after we have retired, i.e. when we have nothing to lose. 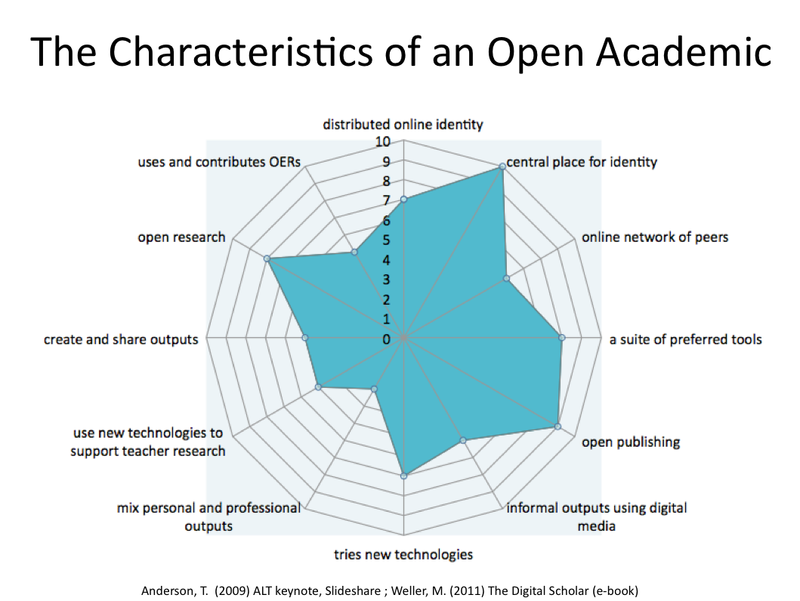 It is interesting to speculate how what proportion of the academic population is ‘open’ in terms of the characteristics we were discussing in the webinar. I suspect it’s rather context dependent, but it would be interesting to know more. Steffi – Thank you too for your kind words. Yes, for me it does feel odd and strangely nerve-wracking to talk to ‘silent’ room, especially when I am hopeless at following chat at the same time as talking. I suspect it becomes easier with practise, but I don’t do this enough to get ‘practised’. Certainly blogging openly becomes easier with time – and from my own experience, I just keep adding a little bit at a time – so for example, I blogged for a long time before I opened a Twitter account. This is not only to do with increasing openness, but also learning just how much I can cope with technically and in terms of managing my time. Hi Catherine and Sheila. Thanks for letting me know about your webinar and posting your slides. I’m not sure I’ll be able to make it, but if not I’ll try and catch the recording. Hope there will be a recording. I don’t think I have any thoughts to add to this, that are not already in the blog post or the webinar recording that I did. My current thinking about openness is being influenced by Deleuze and Guattari’s writings about smooth and striated space, which also fits with our work on emergent learning – but I am still thinking that through, so nothing concrete to say at the moment. 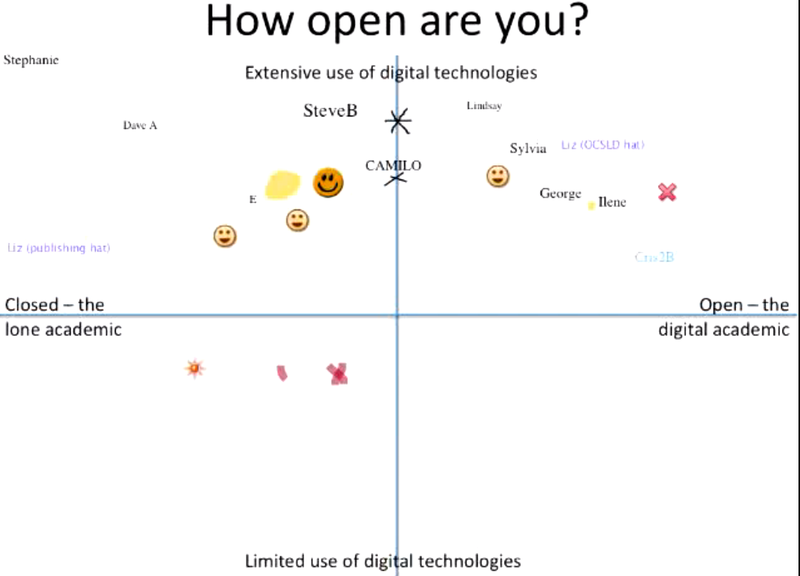 I very much like the idea of thinking about ‘open’ as a space that learners can move into – that’s as far as I’ve got at the moment. All the best for your webinar.